The What:InFocus has added the 55-inch Mondopad INF5522AG to its Mondopad family of touch-enabled collaboration displays. 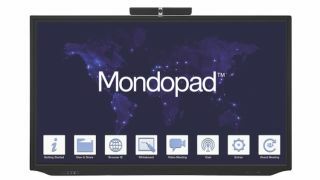 The 55-inch Mondopad is an all-in-one collaboration system that supports HD video conferencing, interactive whiteboarding, web browsing, data sharing, presenting, document annotation, and wireless casting. The What Else: The 55-inch Mondopad features Total Touch Control, a system management interface that eliminates the need for a remote or buttons. Users can touch on-screen icons to switch between sources, or to access the home screen, all applications, and control functions. In addition, the 55-inch Mondopad allows for annotation over any input. Content from the built-in PC, an external PC, or tablet connected via wireless casting, HDMI or VGA connections, can be frozen on the screen, annotated over, and then saved as a screen capture to internal storage or an external USB drive. Like all Mondopads, the INF5522AG ships with a built-in camera with microphone array, remote, stylus, wireless mouse and keyboard, as well as front connections for HDMI and USB inputs. Wireless casting allows users to share content to the display from any Apple, Windows, Android, or Chrome device. The Bottom Line: The 55-inch, 1080p, anti-glare touch display is designed for easy use with edge-to-edge multi-touch supporting 10-point gestures. The Mondopad INF5522AG is powered by an Intel Core i7 processor with 256GB solid-state drive, includes Windows 10, a full version of Microsoft Office, and features built-in Android 5.0 applications including Quick Whiteboard, Quick Casting, and Quick File Viewer for fast access to the most commonly used tools.